Prairie School style hand-hammered copper lantern with slag glass cutouts, copper chain and canopy. Recently, re-wired, American, circa 1930. Measurements include canopy and chain. A hanging lantern with a hand painted enameled glass winter forest scene and stream - for a hall or entry way, with patinated brass hardware. American, early 20th century. 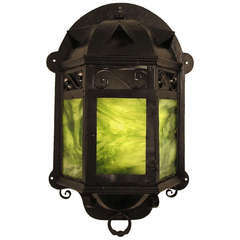 Arts & Crafts period steel and green slag glass wall sconce or lantern. Newly re-wired and re-conditioned. American, early 20th century. An Arts & Crafts hand wrought iron lantern with flaming tendrils retaining the original dappled shade..
A circa 1930s Danish Arts & Crafts ceiling fixture with hammered copper body and glass inset. Measurements: Diameter 9.5" Current drop 23". An Arts & Crafts copper lantern retaining the original ribbed style opaque shade. 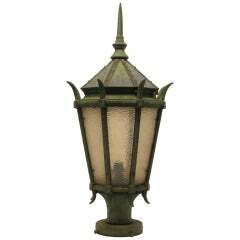 Measures: Height lantern 16", width 7", with a 33" rod which we can reduced in size.